The all-new Mitsubishi Outlander Sport 2012 features several engineering improvements that enhances this compact crossover for better. Jump on to review those changes and find the high res gallery. An all-new vehicle added to Mitsubishi's model lineup just last year, the sensible Outlander Sport has been a stunning sales success for the Japanese auto manufacturer. 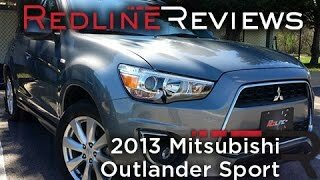 And for the 2012 model year - in just its second year of existence - the Outlander Sport will see a number of engineering improvements made to make this popular compact crossover even better. Improving engine noise isolation on all models equipped with the continuously-variable transmission (CVT). Recalibration of the continuously-variable transmission (CVT) for improved acceleration response and feeling. Adding new chrome accents to the gauge cluster surround and some of the center console controls on SE trim level vehicles. A new 16-inch wheel cover design (ES model); new 18-inch alloy wheel design (SE model); incorporating a rearview camera display into the rearview mirror for the Premium package available on the SE model vehicle. An up-shift indicator light for efficient vehicle operation on ES models equipped with the five-speed manual transmission. Every 2012 Mitsubishi Outlander Sport model is engineered with fuel-conserving technologies including Electric Power Steering (EPS), a higher-efficiency alternator and a wind tunnel-tested body design that provides the best aerodynamic performance in its class. The entry-level front-wheel drive 2012 Outlander Sport ES is available with either a refined 5-speed manual transmission or the advanced continuously-variable transmission (CVT). Standard features include a 140-watt AM/FM/CD/MP3-compatible audio system with four speakers; leather-wrapped steering wheel and shift knob; rear LED combination tail lights; intermittent rear wiper; steering wheel-mounted audio controls; magnesium-alloy paddle shifters (CVT-equipped cars only) and advanced dynamic systems including Active Stability Control (ASC) with Hill Start Assist (HSA). The Outlander Sport SE boasts essentially all of the ES-level trim features but adds sumptuous amenities including the FUSE Handsfree Link System™ that allows voice-activated operation of the audio system and a cell phone; Super-wide beam High-Intensity Discharge (S-HID) headlights; 18-inch alloy wheels; One-touch Start/Stop (OSS) engine switch; automatic climate control; and the FAST-key passive entry system. The Outlander Sport SE is available with either 2WD or with a driver-selected, electronically-controlled 4WD system - the same all-wheel drive system found on the Mitsubishi Outlander mid-sized crossover vehicle. Traction Control Logic (TCL); and an advanced front air bag SRS with passenger weight and driver’s seat position sensors, front seat-mounted side-impact air bags, and curtain side air bags with role-over sensors. All 2012 Outlander Sport models are powered by a fuel-efficient 148 horsepower DOHC 2.0-liter four-cylinder powerplant equipped with Mitsubishi's advanced MIVEC variable valve-timing technology and achieves an impressive EPA-rated 25 mpg city/31 mpg highway. As a customer convenience, every 2012 Mitsubishi Outlander Sport sold will have a full tank of gas at the time the customer takes delivery of their new vehicle at the dealership. FUSE Handsfree Link System with USB port. Premium Package adds: Panoramic glass roof with adjustable LED mood lighting, Auto-dimming rearview mirror with camera system, roof rails, SIRIUS Satellite Radio with free 3-months subscription and 710-watt Rockford-Fosgate® audio system with 9 speakers including 10-inch dual-voice coil subwoofer with Punch® control, In-dash 6-disc CD/MP3 compatible changer, digital signal processor, 3-band equalization and speed compensated volume. Exterior Sport Package adds: Rear spoiler, front corner extensions, rear diffuser garnish, front chrome lower garnish and aluminum-alloy fuel door. Interior Package adds: Piano black audio and shift panel overlay, aluminum and leather combination shift knob. Protection Package adds: Aluminum scuff plates, tailgate protector, rear bumper guard and mudguards.